WE JUST CAME BACK FROM ACADIA NATIONAL PARK IN MAINE AND CAMPED A LOT IT WAS OVERALL A BLAST!!!!!!!!!!!! That was the original full blog post but after a quick word with the sponsors this writer is back to explain in detail what we did on the trip. We set out at 10 am on Tuesday morning for our journey. The bus ride was several hours of ~spiritual journey~ and movie watching before arriving at our camp site thanks to Thomas the bus driver. Upon arrival we set up camp and cooked a delicious barbecue dinner of dogs and burgs, as the vegetarians scarfed down some bomb tofu stir fry. We ended the night around the מדורה (bonfire) with stew, smores, and songs. Spectacular! The next בוקר (morning) we awoke and had an exciting עיון תפילה (literally topics in prayer, discussions about the prayer book and our lives) about finding our own ways to engage with prayer and to place ourselves in the Jewish מסורת (tradition). After a breakfast of eggs and bagels, עידת מעלות went to an adventure at Pirate’s Cove Adventure Golf! 18 greens of fun and pirate puns later, the חניכים (campers) were ahoying and one of them found an eyepatch somewhere. It was great. We then went to Bar Harbor to a nice street area to walk around and shop. The חניכים bought some ice cream or other prepackaged kosher food and were able to appreciate the Maine scenery and coast. As if the day wasn’t busy enough, we then went ROCK CLIMBING UP REAL ROCKS! There were belays and stuff – don’t worry. The חניכים had a choice of four רמות (levels): easy, medium, hard, and not going up. The חניכים who didn’t climb up went to a rock beach where they built an awesome rock wall with this writer that withstood some of the tide but mostly didn’t. Though challenged by the cliffside, מעלות persevered and it was awesome. What was for dinner, you ask? ANOTHER BBQ!! Double the tofu!! This time featuring sweet potato fries too. Dinner ended and we had some time to gaze at the כוכבים (stars) and eat some freshly cooked פיתה (pita). 45 to pack up our tents and get ready for the big move from our camp site. After getting packed, we moved on to hike! 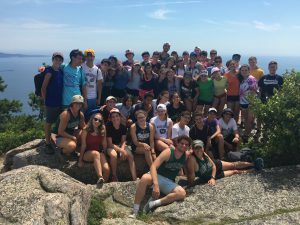 The Beachcroft Route took us pleasantly through Acadia National Park, up and across a mountain and around a lake! The חניכים felt true אושר (joy) as they rounded the final bend at their job well done. We then boarded the bus once more to begin the 4 hour haul back to camp! We were greeted by the third BBQ in a row, and ended the night with an episode of מרחק נגיעה (literally a touch away, an Israeli soap opera about social and religious cleavages in Israel). מעלות, warm and on mattresses, once again fell asleep with a grin.